Visit these links to see some lovely Snowshoes. The following websites and links all contain fabulous info about various aspects of the Snowshoe Breed & some well known Snowshoes. I strongly recommend viewing the Noodles and Nevada & Izzy links so that you see young Snowshoes being enjoyed by their families - this should give you a good indication if the Snowshoe is the right cat for you. A fun filled blog about the first year of a couple's life with their two Snowshoe kittens Noodles and Nevada. Unfortunately not updated recently but full of fun anecdotes, photo's and video's of the adventures of these two young Snowshoes and the delight that their owners have had with them. Well worth the read. Make sure you start at the bottom of the page and read upwards as their journey unfolds - it's a charming story! The youtube page of the same Noodles and Nevada as above. There are a series of delightful video's capturing the adventures of these two young Snowshoe cats. My favorite is the Tunnel Leaping video, although many of these videos are worth watching to see typical Snowshoe behaviour and what you can train your Snowshoe to do! 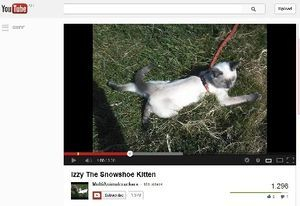 Izzy the Snowshoe kitten is a delightful blog with photo's about a young Blue Colour Point Snowshoe kitten and her families adventures with her. Izzy's owners have taught her plenty of tricks and there are a number of youtube clips about her training including this delightful compilation filmed and edited in Scotland by her 13yo owner. Izzy is a great example of the intelligence of the Snowshoe and what you can achieve with training - further video clips of Izzy are available here. 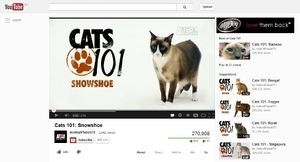 The fabulous show Cats 101 which airs on the Discovery Channel did a feature on the Snowshoe in 2010. The show briefly covers all aspects of the Snowshoe including History, Temperament, Health & Suitability. It also makes mention of the rarity of the breed (380 cats registered over 10 years with the TICA Association). An interesting documentary. Dusty the Snowshoe is one of the more famous cats in the world. 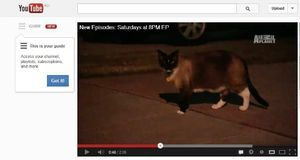 He is well known as the Klepto Kitty or Dusty the Cat Burglar, his youtube clip from Animal Planet having several million hits. Another news clip worth watching is this youtube clip. Dusty has also appeared on the David Letterman Show and in News stories throughout the World. Although theft is not typical cat behaviour it does show his character! He is one smart cat. Max-Arthur has found fame as the Snowshoe cat who rides the Roomba robotic Vacuum. There is a series of youtube clips of Max-Arthur, often also featuring his best friend, a pit bull named Sharkey. My favorite of these shows Max-Arthur has mastered the steering of the Roomba. 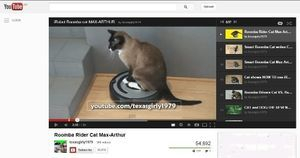 One youtube clip of Max-Arthur riding the Roomba and playing with Sharkey has over 4 million views, while the initial clip has over 2.9 million views. The Snowshoe cat really has got an amazing temperament and is an extremely companionable animal. 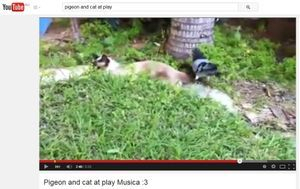 This video clip shows a Snowshoe playing with his friend the pigeon. Whilst I wouldn't recommend this with every cat it certainly shows the Snowshoe can be trained to do almost anything!